Fast, nimble and stable. A whole lot of fun. Maiden flight, crashes, repairs and various testing can be found on this playlist. Some balsa, 3mm sheet and 10mm square lengths. 12 to 15 minute flight time on 1300mah 2S. Goes like a scun cat. 3S capable and FPV ready. My first Tricopter turned out to be a bit of a pig. Over a kilogram in weight and I needed two 2200mAh 3S batteries to get over ten minutes flight time out of it. It flew OK but not as good as the bang buck quad. I designed it for FPV and and flew it FPV for my first time on a multi rotor. It has a David style sprung battery and camera tray with plenty of room for other cameras and even a gimbal. But the initial FPV gear I had on it only weighed 70 grams. This made it hard to justify the tricopter weight of 1.2 kilograms. One crash the wrong way and the mass will smash the FPV gear to bits. So I decided to start from scratch and build it as light as possible. I started by building it around these small hexTronik motors and 5x3 props. I have been successfully using this combination with three cells on my flying wing for some time now. To keep weight to a minimum I decided to use balsa as the frame. No hinges or folding arms in this design just two beams in a T shape held with some balsa sheet. Dimensions are calculated with a bit of trigonometry. The CG and KK2 go in the centre of the three prop shafts which are in an equilateral triangle. I chose to leave some excess to protect the props in the event of a crash. This costs an extra 6 grams in balsa. Rather than epoxy I used this glue which dries fast and I find stronger than epoxy and its cheap as chips. Search for "Modified Acrylate Adhesive Glue 8821" on Ebay. Prepare your surfaces by repeatedly stabbing with your hobby knife. The glue will get into the holes and create a stronger bond. Glue and clamp. The platform at the front will be for my FPV gear which will add about 70 grams to the all up mass. Once that is dry we are ready to prepare the motors. Simply drill a hole in your balsa stick to mount the two front motors. Place the glue on the motor first so it does not get in the bearing. This saves the weight and the problems of screws coming loose with the existing mounts. Before we glue them in we will attach the ESCs to the motors, this is what we are aiming for. Seeing as they are small ESCs I decided to remove the heat shrink and mount them in the prop wash so that they would get plenty of cooling. I'm yet to test it but I figure that they will be able to pull more than their rated amps with this much cooling. I cut the motor wires down to about 30mm. IMPORTANT. You must scratch off the enamel on the wire so the solder can stick. This is probably the most tedious part of the build but it is important to get it right. The top strand has the enamel removed. Once cleaned and tinned we can solder it to the ESC. First you want to remove the silicone wires and put them to the side. Don't worry about which wires go where, as we will get the direction right when we flash them. Some careful soldering and thats the front motors done. The ESC on the rear motor is a little different as we need to allow for the yaw servo movement. I removed the bell from the motor to make it easier to work with. The wires were shortened more this time and then the flexible silicone wire soldered and heat-shrinked on. Plan is to have all the flexing happening in the silicone wire and keep the motor wires fixed. Now here I saved a lot of weight. With such small motors there is no need for a bulky yaw hinge. I lashed the servo horn directly to the motor with Dyneema fishing line and then gave the lashing a coating of glue. The braided dyneema is so strong and thin that I manage to slice my hands a bit while doing the lashing, be careful. The wires should be perpendicular to the servo horn plane of rotation. After the glue dries the other three arms can be cut off. Note the clearance to be able to screw the horn onto the servo. The servo is roughed up and glued directly to the balsa with a small spacer to mount the ESC on. You can also see above the fine wires for flashing the ESC. I did the flashing last. These will be de-soldered once flashed and the motor direction tested. I have powered the servo with the UBEC on the rear ESC only. The signal wire is left long to go to the KK2. The receiver is powered by the left ESC and the KK2 by the right motor. More on the power distribution and signal wiring later. Here is are some close-ups of the rear end. Note the added balsa to support the motor wires. Another advantage is limited slop. Disadvantage is that a serious crash will bust the servo. But when the servo costs only $3.50, who really cares. Replacement gears are $1. 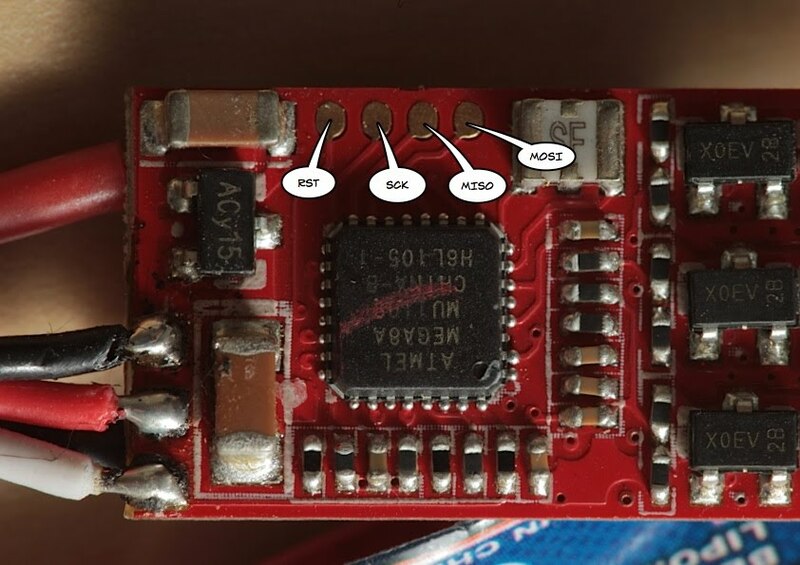 Follow my SimonK guide for flashing the ESCs. Just use bs.inc instead of bs_nfet.inc otherwise you will smoke the ESCs. Final weight was 219 grams. Compared to my previous tri-copter it works out to one sixth of the force on any given part in the event of the crash. Thats most of the hard stuff. Wiring diagram will be coming soon. I should also explain why I have offset the KK2 but I'm not. All I will say is there is a good reason for it. The rest can be shown in pictures..